Eid-ul-Adha is more generally known as Bakra Eid. It is celebrated on the tenth of Zil Hajj and Muslims throughout the world sacrifice animals like goats and sheep in the memory of Prophet Ibrahim [PBUH]. While many individuals believe that eating meat is not a good idea specially the health conscious people think so. But we are here to give you more reasons to eat meat this Eid. These reasons will advise you to add more meat to your diet plan this Bakra Eid 2017. First and most important reason to eat meat this Eid is that Individuals are meat eaters by nature and our bodies require the nourishment that meat gives. Not consuming meat might lack in these nourishment. The proteins from the meat are very important for the body. In all the proteins, the amino acids that are required by the body are found. Though the proteins we get from plants don’t have a wide range of proteins and are not promptly absorbable by our body. Having quality protein found in the meat likewise enhances the level of nutrition. In the previous decades, there was a misinterpretation that eating meat contributes in gaining the body weight. However it is discovered that the generally the people who just feast upon starch and sugar confront fat issues the most. Studies have detailed that individuals who eat protein rich food put lesser weight on than those eat the carb and sugar rich sustenance. One of the reasons to eat meat this Eid is that it helps promoting bone health. Truly, that is right. While regardless of what you may hear that protein causes lost calcium and bone thickness, it basically isn’t true. The topic of bone health is frequently discussed majorly within ladies, however, men should also be aware of keeping up bone healthy. We can’t think about a perfect eating routine without including meat in it. A sound & healthy eating routine comprises of meat, eggs, dairy items, vegetables, natural products, nuts and entire grains. Avoiding meat from our eating routine enforces harm to the body; and the veggie lovers are more likely to face the medical problems. So this Bakra Eid, no need to avoid meat, so meet and greet everyone, eat more of meat and enjoy every bit of Eid ul Adha. And if you get bored of the usual eating routine, Supermeal Pakistan is here. So order online, or call 111775775 . What fries are to burgers, toast is to tea & tea is to breakfast, similarly friends are to life. So a big shout out to one of our sweetest best friend – Food, which has always been our soul partner when the world fails to impress us with its charm. So, Happy Friendships Day, Let Food Be Your Best Friend! The love of food can never get pale, the reason being that in the oddest hour and minute of the day, it remains loyal to us in the best possible manner. Have you ever sat down in a corner, enjoying your space and imagining a world of your own? That’s when you realize that the world is not that awesome place and there’s only 1 thing that can save you from all – Food. Here comes the best part of life, from breakfast to dinner, you may forget everything in life but when it comes to food, you automatically become charges and all set to try a piece of donut, or a cup of tea, or a simple chocolate. It all brings peace and harmony to life. In the laziest hour of the day, Supermeal can be your best friend bringing all your favorite restaurants on one platform. Have a cheesy mood? Try ordering delicious cheesy pastas and range of Chinese food. Craving something sweet? Order variety of desserts from top most bakeries and cake stores. So this Friendship’s day, let’s be loyal to our eternal loving partner, our soulmate – food and, let food be the reason we smile and cherish every moment in life. To make your Friday and weekend enjoyable, Supermeal.pk brings you hand picked discount and offers from Karachi’s famous restaurants and takeaways. You can get up to 70% discount on your favorite meals. These deals will be available on 25th and 26th November 2016 only on Supermeal.pk! Gather with your family or friends this weekend and enjoy super khanay at your home. 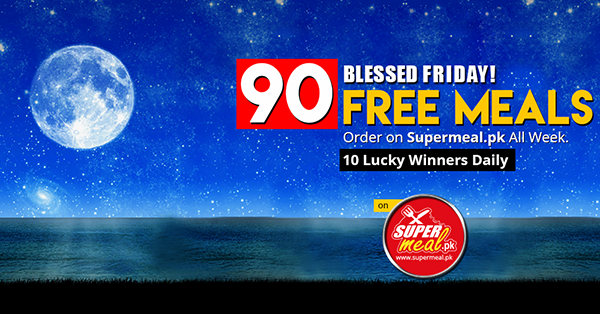 Supermeal.pk also brings you an opportunity to WIN 10 FREE Meals daily. All you need to do is order your food via www.supermeal.pk between #25thNovember and #2ndDecember 2016. 10 lucky winners will be picked daily for FREE MEALS which includes Fast Food, Pizza, Barbeque, Rice, Rolls and many more mouthwatering meals. Gather with your family & friends this weekend and enjoy super khanay at your home. DISCLAIMER: This is not a spam and this newsletter is being sent to you as you had opted-in for updates of our website, if at any stage you want to unsubscribe our newsletter, then you can just send a reply to this email with UNSUBSCRIBE written on the subject line and we will eliminate you from our mailing list.